The 2018/2019 Season Group Fixtures of CAF Confederation Cup has been made following the conclusion of the final playoff round. The draw for the group stage was held on 21 January 2019, at the CAF headquarters in Cairo, Egypt. The 16 qualifying clubs, including the winners of the first round with the best CAF 5-Year Ranking, Étoile du Sahel, and the 15 winners of the play-off round of qualifying, were drawn into four groups of four. The clubs in each group will play each other on a home-and-away round-robin basis. The winners and runners-up of each group will advance to the quarter-finals of the knockout stage. The group stage is scheduled to run from 3rd February to 17th March 2019. The winners and runners-up of each group will advance to the quarter-finals of the knockout stage. In the knockout stage, the eight teams play a single-elimination tournament. Each tie is played on a home-and-away two-legged basis. If the aggregate score is tied after the second leg, the away goals rule will be applied, and if still tied, extra time will not be played, and the penalty shoot-out will be used to determine the winner. The draw for the knockout stage (quarter-finals and semi-finals), will be held on 20 March 2019. In the quarter-finals, the winners of one group in the knockout stage play the runners-up of another group (teams from the same group cannot play each other), with the group winners hosting the second leg, and the matchups decided by draw. In the semi-finals, the four quarter-final winners play in two ties, with the matchups and order of legs decided by draw. In the final, the two semi-final winners play each other, with the order of legs determined by the semi-final draw. The CAF Confederation Cup final for the 2018/2019 season will be decided over a two-legged affair on a home-and-away basis. 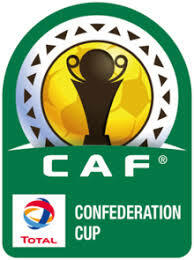 The first leg of the CAF Confederation Cup Final will take place on 19 May 2019 while the second leg will take place on 26 May 2019.